Teapots and Kettles go a long way to enhance the tea drinking experience. They can significantly change how you make the tea and the way you serve it too. It is for this reason that if you are going to make the most of the experience every single time you want to have tea, you must choose the teapots and kettles that will be to your satisfaction. 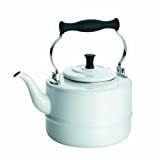 There are however many different types and brands of teapots and kettles. For some people knowing the type of teapots or kettles is enough while for others knowing the brand is much more advantageous. As much as this is an advantage when it comes to giving you variety, it can prove to be a disadvantage when it comes to choosing as there are so many to go through. It is for this reason that the Tea Supply has divided the teapots & kettles shopping experience into two major categories. You can choose to either shop for teapots & kettles by type or you can do it by brand. For example, you can shop for the specific teapot from the Adagio Teas brand or you can simply browse through all porcelain teapots & kettles. Serious about purchasing a teapot or tea kettle today? 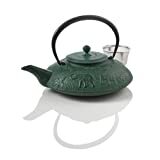 Check out the best selling tea kettles from our tea product reviews section now. Boiling water for tea is rarely this much fun. Watch water go from the cold calm to rapid boil in this stylish, easy-to-use kettle. 60 ounces. An Elephant never forgets...to join you in enjoying a steaming pot of your favorite tea. The Elephant is a symbol of the strength of the mind in Buddhism teachings, as well as astuteness, strength and stature, wisdom, patience, courage and luck. The clarity, beauty, and convenience of an included infuser to make loose leaf tea, the Vienna is your PERFECT teapot! The Borosilicate glass is an ultra smooth surface that is durable and easy to clean, and will never go cloudy even after years of use. Since the VIENNA teapot does not have any plastic or metal parts, it will never impart a flavor to your water or tea, and will never rust or warp, and resists staining as well. Since this teapot has a large base it CANNOT be used with the GROSCHE SAHARA teapot warmer. The VIENNA Teapot brings you another unique design tea pot with its special hand-blown Hexagon shape. The large and comfortable handle makes this an easy teapot to handle as well. The long infuser means you can make a half pot of tea at a time as well, no need to fill up the water all the way to the top to make your gourmet loose tea. 1200 ml is a excellent size to share tea with friends. When infusing superior tea, don't you need a excellent and elegant infuser teapot like the VIENNA by GROSCHE? FARBERWARE 50122 Silver Classic Series 10-Cup Stovetop Tea Kettle in Silver Type: Tea Kettle Height: 9.75" Width: 8.75" Depth: 8.75"
GLASGOW Teapot: With classic and subtle European design notes, the quality contemporary look of the GLASGOW teapot is an elegant part of any table setting. Its 1 liter (approx 34 fl oz) Capacity is great for 4-5 tea cups at a time. Perfect for an after dinner tea setting, this steeper tea pot is made of medical grade GROSCHE Borosilicate glass that is heat resistant, lightweight, and strong. Perfect for use with a GROSCHE SAHARA Warmer, or one of their other fine Teapot Warmers (not included) to keep your tea warm for hours. With the GLASGOW, you can just add more water and allow your tea leaves to re-steep giving you many more great cups of tea to enjoy. You can also use it without the steeper for flowering teas by removing the strainer. It is top rack dishwasher and microwave safe, though GROSCHE recommends hand washing for long product life. This quality GROSCHE teapot is guaranteed against ever becoming cloudy even after many, many years of use. 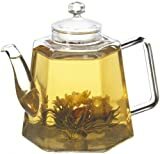 Just boil your water (separately) and add it to the teapot along with your favorite loose tea, flowering teas, or tea bags to the teapot to prepare your teas just the way you like them. The 1 Litre (33.8 Fl oz.) size makes this a great size for having tea for 2 to 5 people. You can always add water to an emptying kettle to re-steep your teas. It's a 3 piece set; with the teapot, strainer / Infuser included, and the teapot lid. Brand new, it comes in the original GROSCHE packaging box. Enjoy life's simplest pleasures, past and present with these vintage styled goose neck spout teakettles. This kettle features a stainless steel and rubberized handle for safe pouring that keeps your hands away from the heat. Drip free pour spout allows you to conveniently serve tea and hot liquids with ease and efficiency. Secure fitting lid fastens tightly to the kettle to seal in heat. 2 quart capacity.